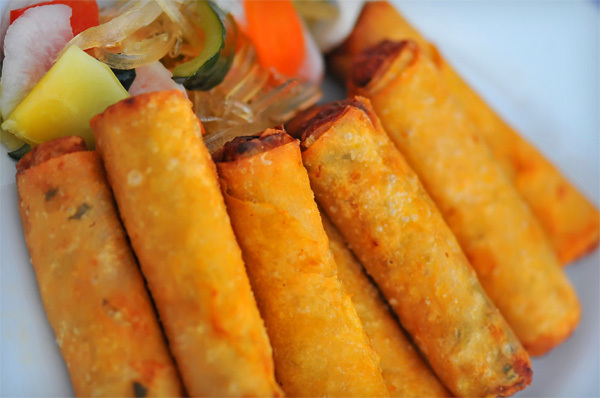 A popular Filipinized adaptation of the Chinese eggroll, usually stuffed with meat, shrimp, carrots and crunchy water chestnuts. 2 Mix the pork, shrimp, water chestnuts, carrot, garlic, spring onion and soy sauce in a bowl. Season with the salt and pepper. 3 Place 1 heaped tablespoon of the pork-shrimp mixture on each eggroll wrapper. Roll the wrapper up tightly and seal the ends with a few drops of water. Repeat until all the filling is used up. 4 Heat the oil in a wok. Deep-fry the prepared eggrolls in the hot oil until lightgolden brown. Remove with a slotted spoon and drain on paper towels. Serve with a bowl of Sweet and Sour Sauce on the side. Note: Eggroll wrappers are sold in various sizes. This recipe calls for 5 in (121/2 cm) square wrappers. They are sold in packets of 25 or 50 wrappers in the refrigerator or freezer section of supermarkets. If using larger wrappers, double the amount of filling used in each eggroll.